One of the most important responsibilities of Directors of Music is the shaping and shepherding of all those inc\volved in the musical life of the parish, professionals, volunteers and choirs, to view themselves as as true ministers of service to the community gathered at prayer. Since the reforms of Vatican II, the role of Cantor has become as important in Catholic liturgy as its counterpart has been (for nearly three millennia) in the Jewish tradition. The cantor is the catalytic link between the latent power and prayer of the music, and the receptivity of the assembly to be moved by that power to an authentic response. The cantor, through his or her genuine prayerfulness and engaging manner, is the link between what the musicians are offering as a foundation for structured prayer, and what the assembly contributes to the building of the Liturgy. The way he or she approaches the place from which they minister, the way they gesture the participation of the people in the pews, the way they authentically pray the music--all this works to either encourage of discourage the participation of the assembly. Thorough knowledge of the music so that there can be constant eye contact with the assembly, is critical. As cantors, we are LEADING the prayer, not READING it, and we cannot engage the spirits of the people in the pews if we are glued to the music and focussing on that instead of communicating with the people. We cantors are communicating with the assembly, singing our prayer with the intent of eliciting the prayer of the people to whom we are ministering. In a deep sense, we cantors are feeding people, and, as we would want with any meal that is a nourishing experience on all levels, our cheerfulness, our comfort with the music, our ease with our leadership, our welcome to the assembly, our vulnerability, and our strength--in short, our full humanity, must be a part of what we offer the people who come to be fed. This is a task of great responsibility, not to be taken lightly. The best food in the world can become unpalatable if presented nervously, arrogantly, inauthentically, with uncertainty, unconfidently, impersonally, or without genuine love. 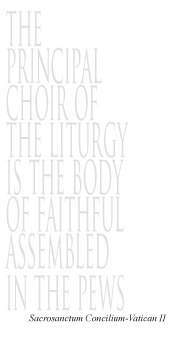 Our challenge as cantors is to make sure that the nourishment of music and scripture so powerfully available in Liturgy truly reach the hearts and souls that come to be fed each Sunday.